Carlos Ayala and Jessica Parker take a selfie at the Nation of Makers conference at the White House. 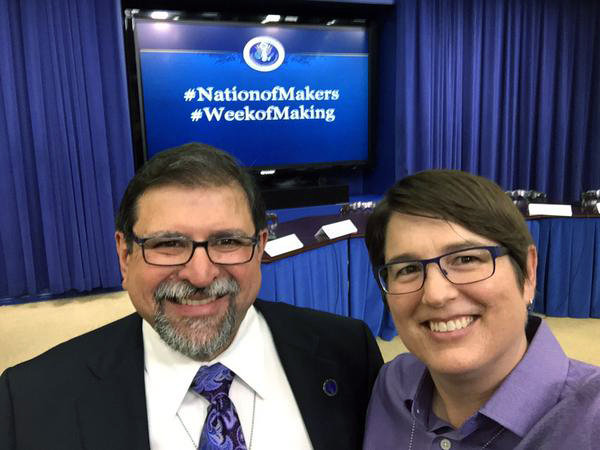 Sonoma State University's School of Education was invited to the White House Friday morning to discuss the Obama administration's Maker Schools Alliance. U.S. Chief Technology Officer Megan Smith and Maker movement founder Dale Doughtery were among the those speaking at the conference, which included representatives from a wide variety of groups like the U.S. Department of Education, the National Science Foundation, the World Bank and many others. "It was an honor to be one of the 100 invitees to this conference," said Carlos Ayala, Dean of the School of Education at Sonoma State. "Everyone needs equal access to the economic engine of the United States. This conference demonstrated that Making is a path that is clearly focused on that goal." Sonoma State is a leader in Maker education, with the first cohort of teachers graduating from Sonoma State's Maker Educator Certificate Program this year. The program is the first of its kind at a state university level, and has sparked interest on state and national levels. Ayala was invited to speak with White House officials about the program and how it might be used as a template for similar programs around the country. "Through their Maker program, SSU is helping make sure every student, no matter who they are or where they are from, can get a quality education and pursue jobs in the growing fields of science, technology, engineering and mathematics," said U.S. Rep. Mike Thompson. "Their recognition by the White House is a testament to the outstanding work they are doing to train our next generation of innovators and entrepreneurs." The meeting with officials from the Office of Science and Technology kicked off the White House's inaugural National Week of Making, June 12-18, coinciding with the Washington DC Maker Faire. "My Administration is committed to spurring manufacturing, innovation and entrepreneurship by expanding opportunities for more Americans to build products and bring them to market," said President Barack Obama in his speech proclaiming the National Week of Making on June 11. "To continue to build a Nation of Makers, we are committed to engaging students at every level in the hands-on learning of science, technology, engineering, and mathematics (STEM) to inspire them to pursue their own passions and excel in STEM fields." Ayala, education professor Jessica Parker and Sonoma County Superintendent of Schools Steve Herrington attended the conference to represent the Maker Educator Certificate Program. Ayala and Parker have been in contact with the White House Office of Science and Technology since the first National Day of Making in 2014. Maker education doesn't have to end after high school, and Ayala is passionate about bringing Making into higher education. "Making fits naturally in K-12 schools," said Ayala. "The next question is what does it look like at a four-year university?" Americans need more training on how to manage their money. And educators agree that such training needs to start at a young age. Does math education need an extreme makeover?